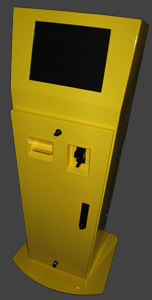 Welk-ko fabricates an outdoor kiosk that is designed to work in all weather conditions. It features a solid state PC running Mircrosoft Windows XP Professional and a 15" daylight readable sunbright projected capacitive touchscreen. The projected capacitive touchscreen is designed to work with either a gloved or bare hand in all weather conditions; even rain and snow. In cold climates the kiosk is equipped with a thermostatically controlled passive heater to keep components warm and prevent snow and ice from building up in inclement weather. With a proven track record, our outdoor kiosk is a proven winner. technology our outdoor kiosk is world class.